The verse above has been with me a lot the last month. It’s one that has been close to my heart throughout this journey and has made appearances in past trials as well. I find comfort in several things about this verse. 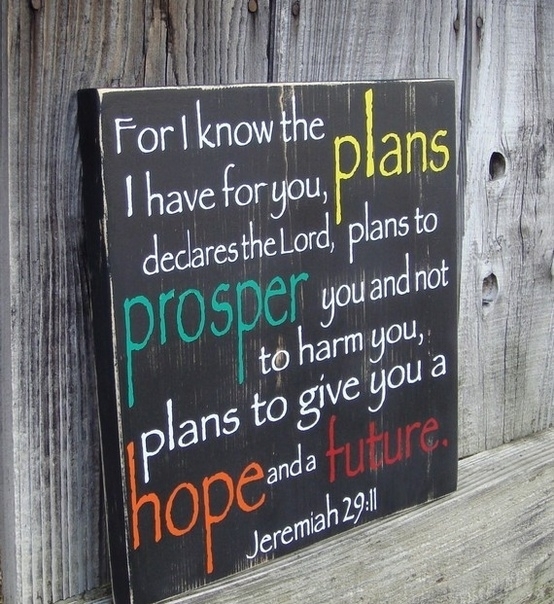 “For I know the plans I have for you…” God knows what He’s doing. He sees the whole picture and we only see what is directly in front of us. We might get to see a couple steps down the road, but really we don’t know how everything will work out, but He does. “Plans to prosper you…” According to the World English Dictionary, prosper means to thrive, succeed, etc. or cause to thrive, succeed, etc. in a healthy way. I can and will grow from this experience in a healthy way. “Not to harm you…” God is not allowing this to happen because He’s mean. He doesn’t want us to hurt. I compare this to when a parent needs to allow their child to go through a difficult time in order for that child to learn and grow. I think this is a complicated emotion for any parent. “Plans to give you hope and a future.” God wants us to see hope in this. He wants us to look to the future and past any pain that we’re currently feeling. I take comfort believing that there is hope in this and we will have a bright future beyond this dark and painful experience. This is how this verse speaks to me personally. It is not an interpretation from a Biblical scholar. You may feel God speaking to you through this verse differently. Today is the first day of my third trimester. This scares me. I’m trying really hard to look at each day with this baby as a gift and not allow my fears of the unknown to get in the way. But I can’t help but think that this journey is almost over and I don’t want it to end. I’m scared because according to man and science, my time with my baby is almost over. On top of the regular first-time mom labor and delivery fears, I have to consider that once those contractions start, instead of saying hello to my baby, I may be saying goodbye. That is heart-wrenching. I hate it. I hate that it’s even a possibility. It breaks my heart and scares the crap out of me. I also have to take into consideration that the doctors expect that the baby will come early, probably in January instead of February. So not only is my pregnancy journey almost over, but it may very well be cut short. On the other hand, I’m thankful for every single day I get with this baby. I’m thankful for every kick I feel. And I desperately, desperately pray that God will give us a miracle beyond our imagination and completely heal this child. I pray we get to bring this baby home and the doctors are completely baffled by the changes in her health. And I pray for peace, strength and comfort for my Timmy and I if God’s plan means we have to say goodbye to our baby. I’m thankful that if this baby doesn’t get to come home with us, that we will get to be with her in Heaven one day. I’m thankful for the wonderful people in our lives who have gone on before us and who will get to enjoy her in Heaven before we do. My friend Alicia sent me this poem several years ago when I was going through my divorce. I used to read it over and over again. Looking back, I see how what I thought was a dead end was really just a bend in the road. I try to remember that now as the road ahead of us changes. To valiantly keep on trying? The tears that the heart is crying? And gain strength with Him at our side. And He tells us it’s only a bend. Is the sweetest and richest and best. Let go and let God share your load. You’ve just come to a bend in the road. Reading and following your journey has helped me in more ways than you will ever know. I’m thankful to know you and listen to your thoughts and prayers as I go through my own struggles right now. You help me see the light at the end of the tunnel, and for that, I am forever grateful to you. You have always been there for me and you don’t even know it. 26 years later and I still enjoy your strength and faith. I pray for you and your family every night. So thank you for sharing your faith with me. I love you sweet friend! Praying for you constantly that God will give you the desires of your heart soon as well as peace, strength and comfort to go on each day as you wait for His plan to unfold for your family. I’m blessed to have known you the past 26 years and thankful that we’ve kept in touch all this time. Thank you for this sweet post. You are helping me too! Hang in there! Jessica, I ‘ve just discovered your blog, thanks to your Mom. What wonderful faith you are sharing with others! You have been in my prayers for a long time, and I have been sharing your name in prayer in my Bible class on Sundays. God bless you on your journey I love you!